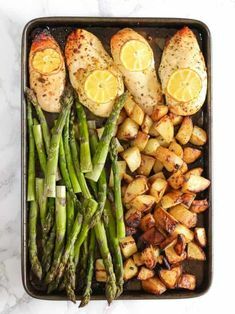 The weather is starting to look a little more like Spring! 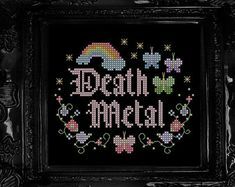 This morning I woke to birds chirping outside my window. With temperatures being so cooperative, I almost wanted to venture out farther, but thought better of it. 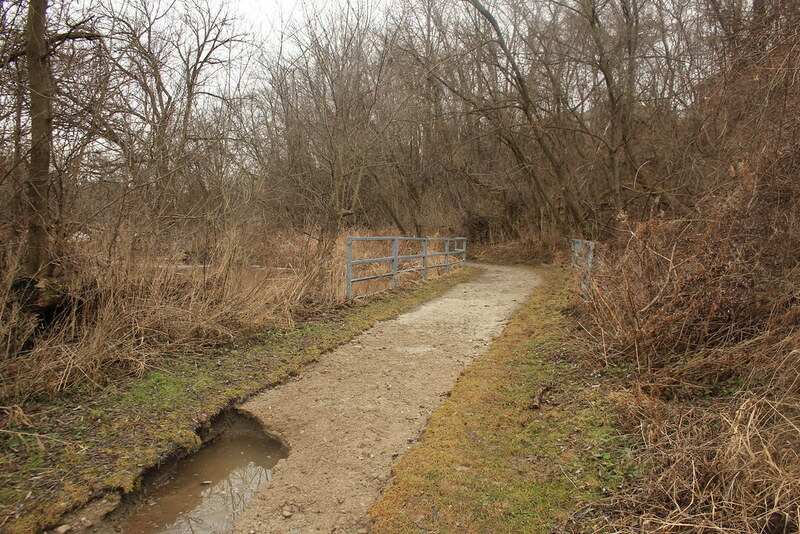 It’s still early enough in the year to knock off some of the more “urban” trails. 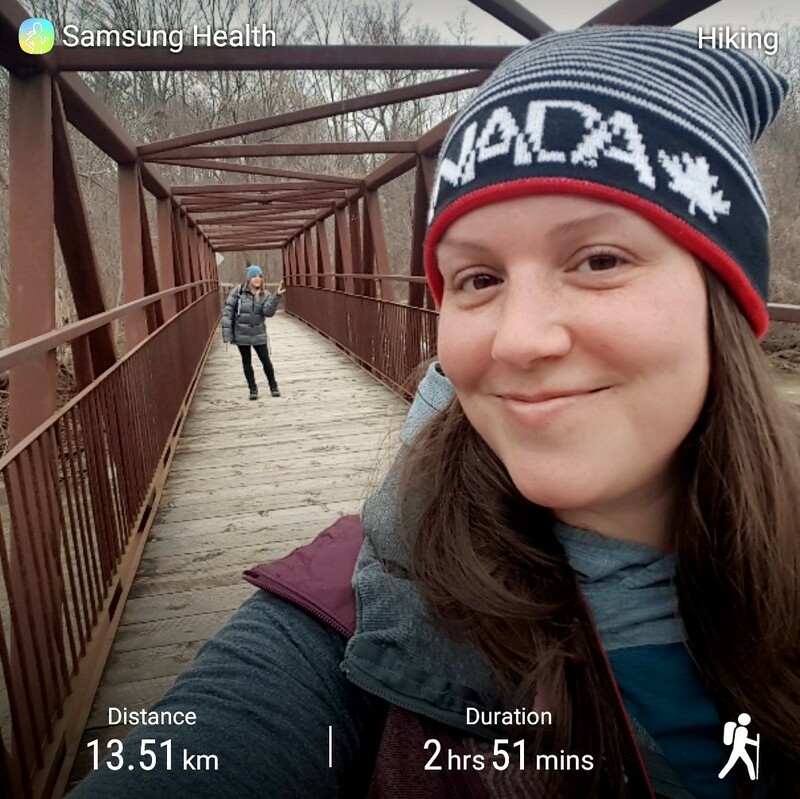 So, off to Mississauga we headed for our little adventure along the southern part of the Culham Trail along the Credit River. 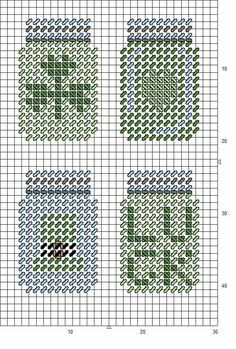 Now, maybe there is a proper map of this somewhere hidden in the abyss of the interwebs, but I couldn’t find it in any of the usual places. 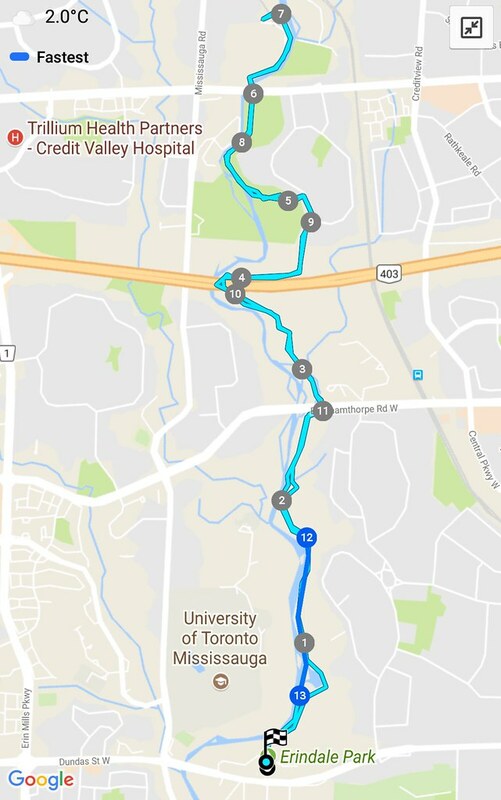 Instead, I present you my map of tracking the actual route we followed – complete with kilometer markers! 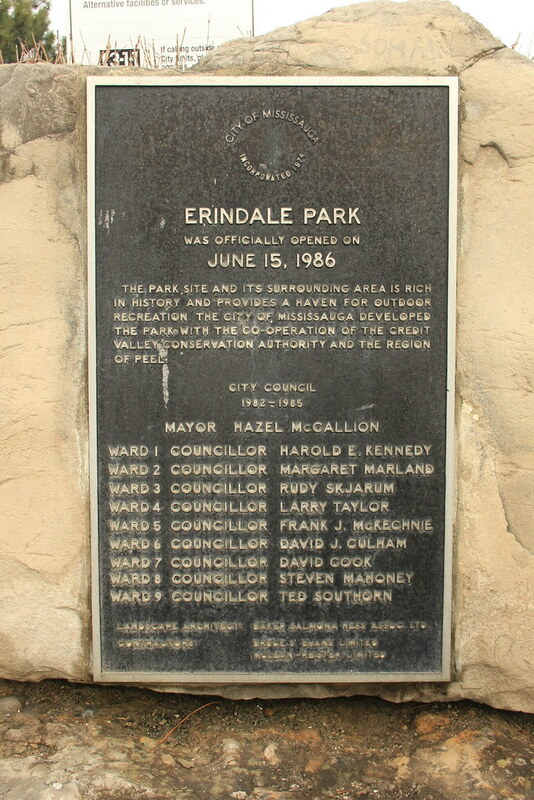 We started at the south end in Erindale Park, off Dundas St W. This looks to be free parking all year long. 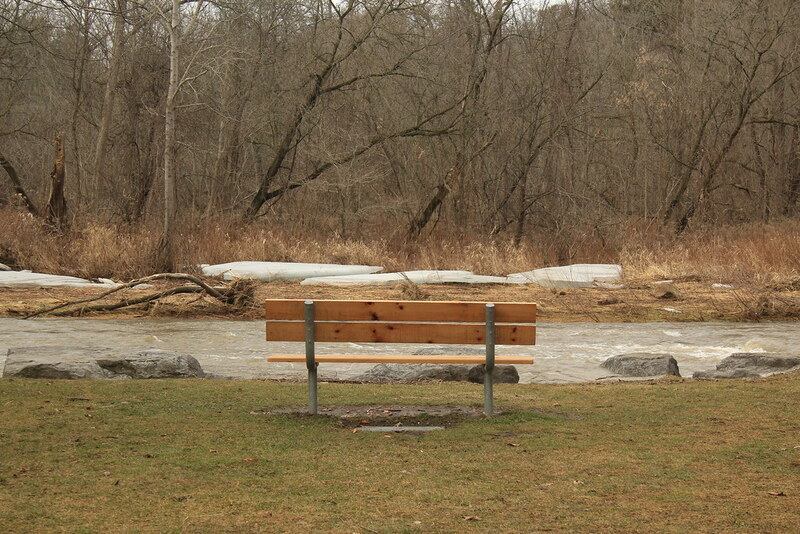 The park itself has loads of picnic benches scattered about and can accommodate larger outings too. We found out that we were only a little over a month older than this park! ’86 twinsies. 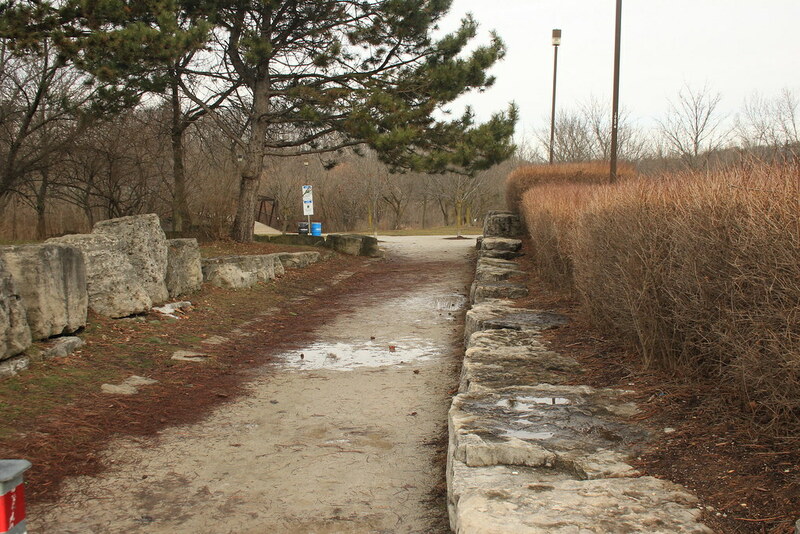 Being a city park, and city trail, it’s quite well-maintained. 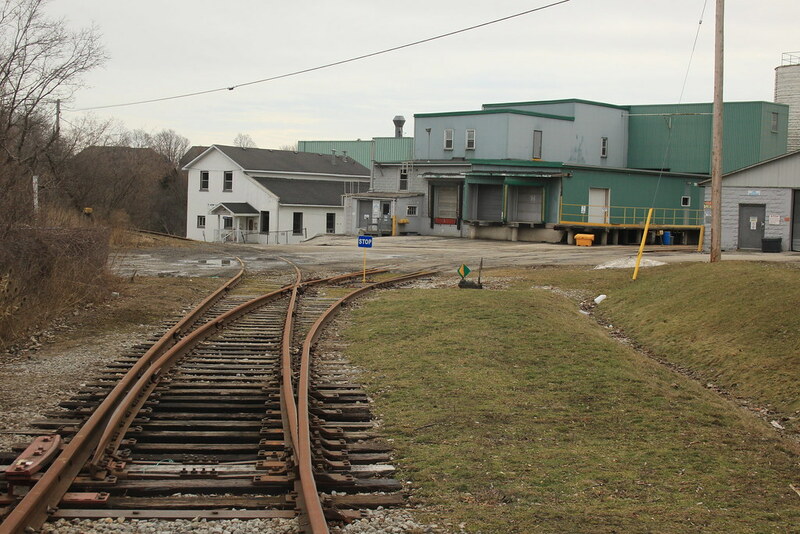 The majority of it is crushed limestone/gravel with some sections paved. All the bridges were well-constructed and never made us think twice before crossing them. We didn’t cross this one in particular, however. 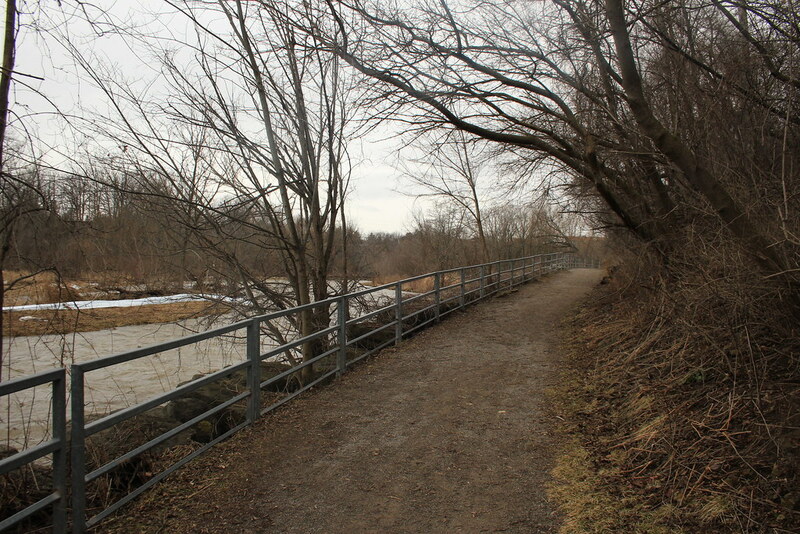 There are two stretches of the trail within Erindale – one follows the river’s edge, the other follows the edge of the picnic and fields. They both go in the same direction, mere meters apart. 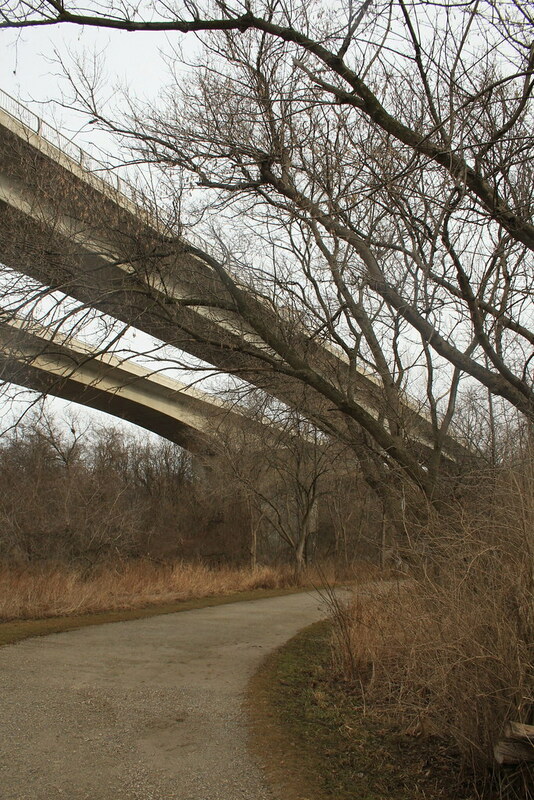 We followed the elevated path along the field. 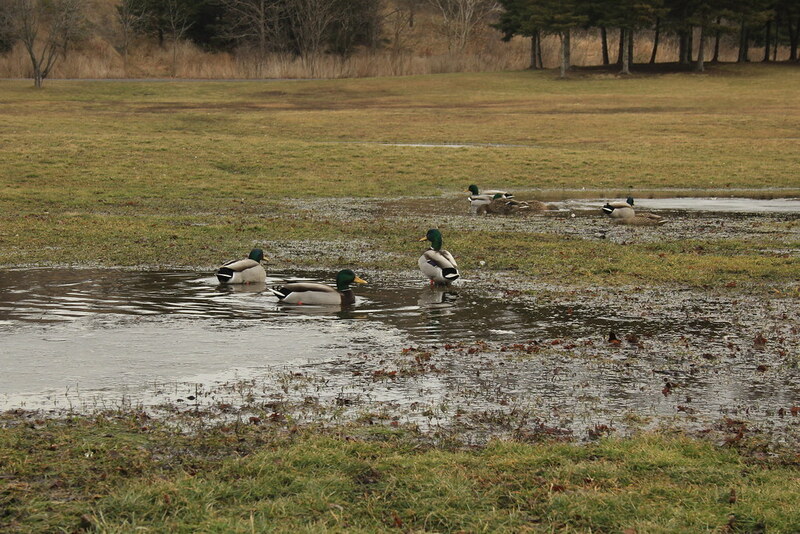 Though today, the field wasn’t so much a field as a makeshift pond for all the feathered friends. Many ducks and geese were enjoying themselves here. 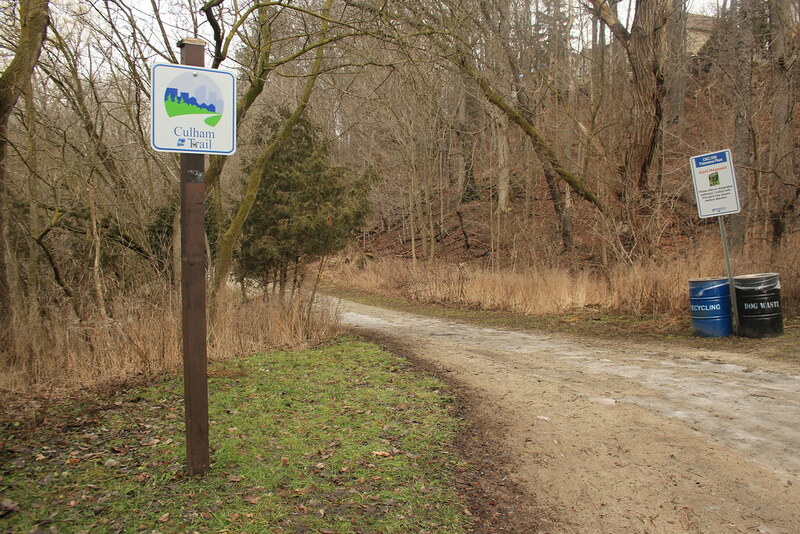 A short walk from the parking lot, past the picnic areas, you’ll find yourself at a crossroad for the Culham Trail proper. To the left, and off we go. What we didn’t take in to consideration was the recent heavy rains and last week’s soaring temperatures. 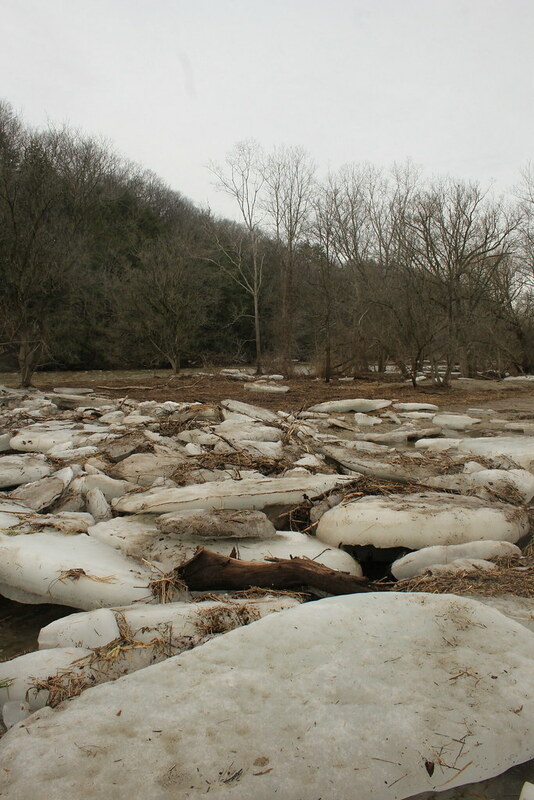 This area flooded heavily and the river left it’s ice behind in a giant mess. It was actually pretty fun to climb over. And slippery. And muddy. 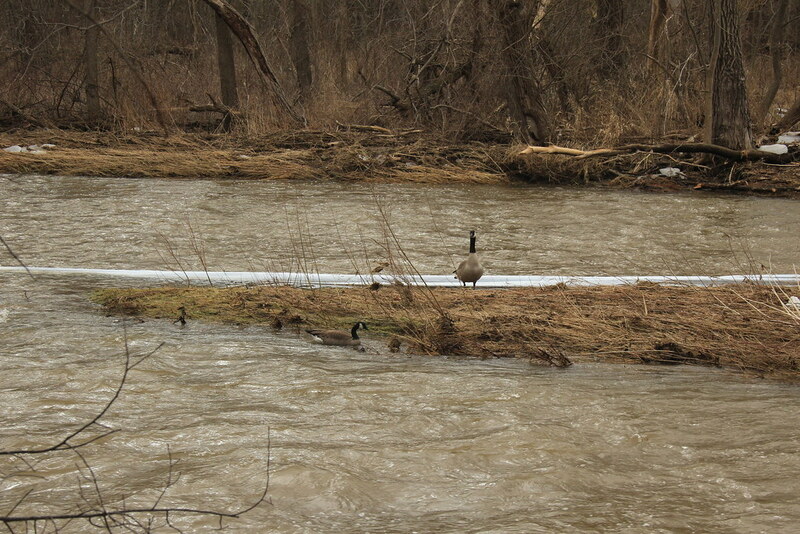 The ice lessened as we moved along. But the mud didn’t. Take a seat with a view of some lovely ice blocks from up the river. 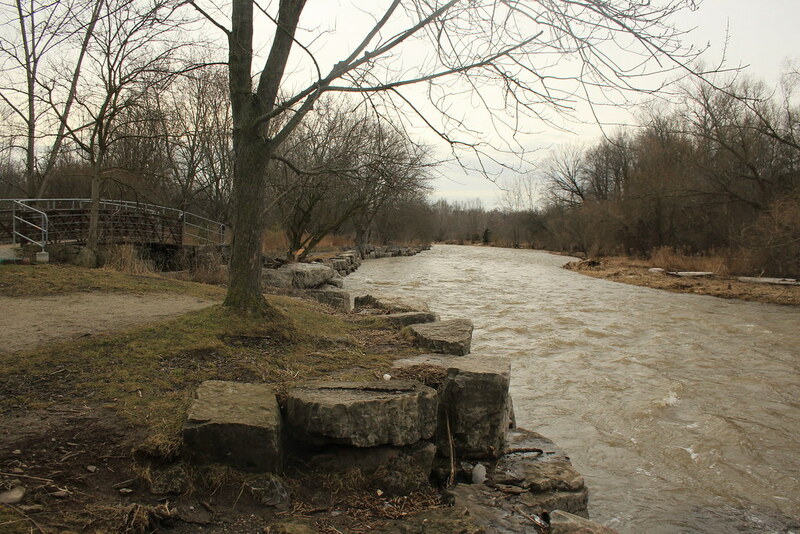 I’m not very familiar with the Credit River, but I imagine it’s a fair bit higher than usual at this time. Though the reinforced river edges tell me it’s definitely a force to be reckoned with even through some drier periods of the year. 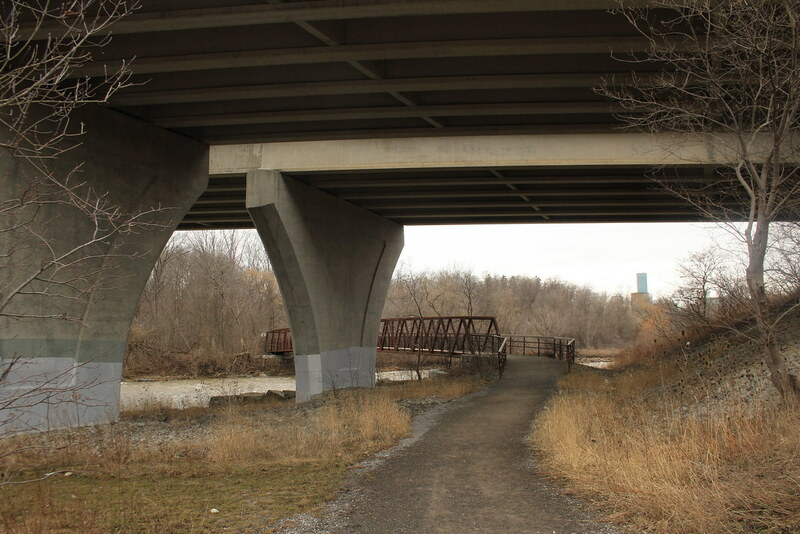 Culham Trail makes it way under several cross streets. 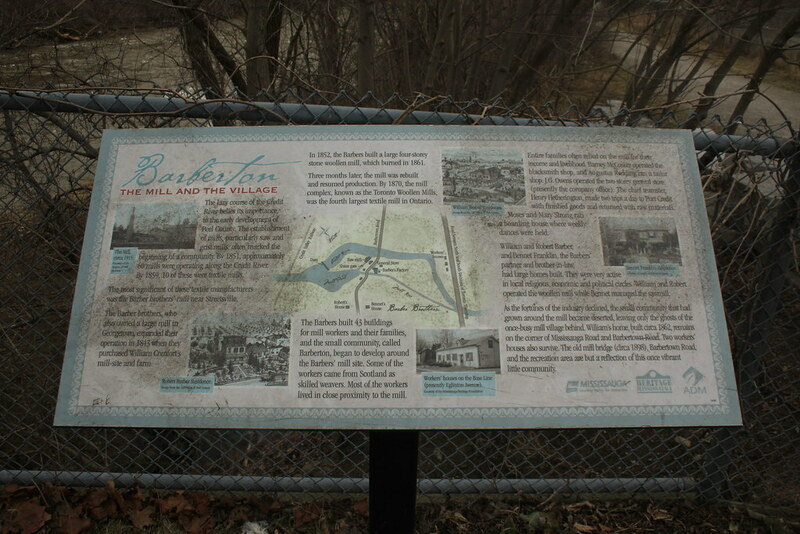 The first we passed was Burnhamthorpe. There is another access point here with parking, though we didn’t go up to check it out. 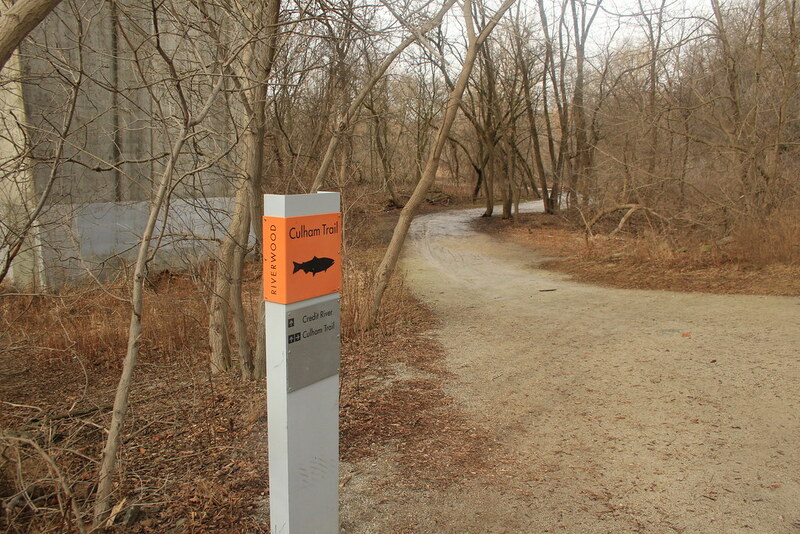 This way or that way for Culham Trail! 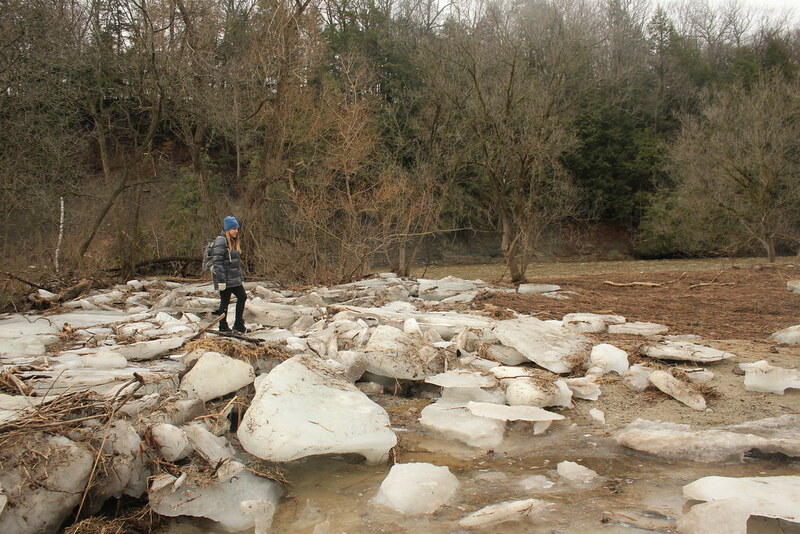 North of Burhamthorpe, the trail was quite washed out. 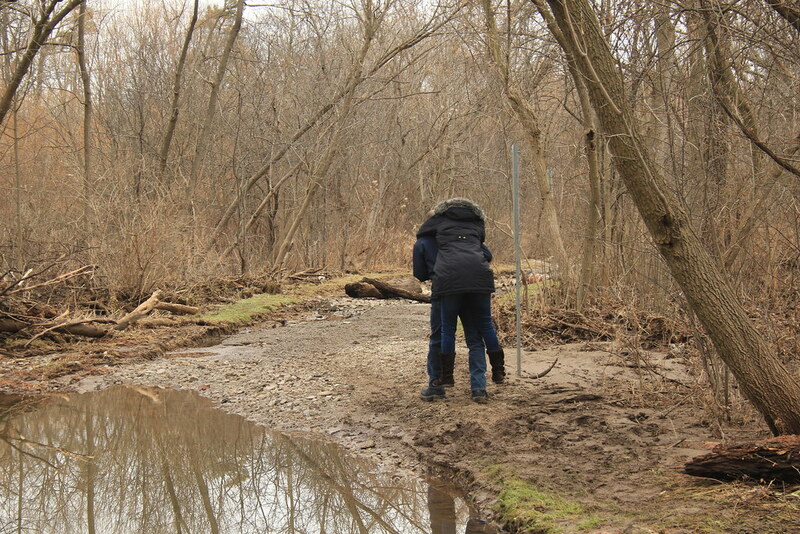 All the top layers of gravel had been taken with the current and deposited at the edge where the trail makes a hard left. 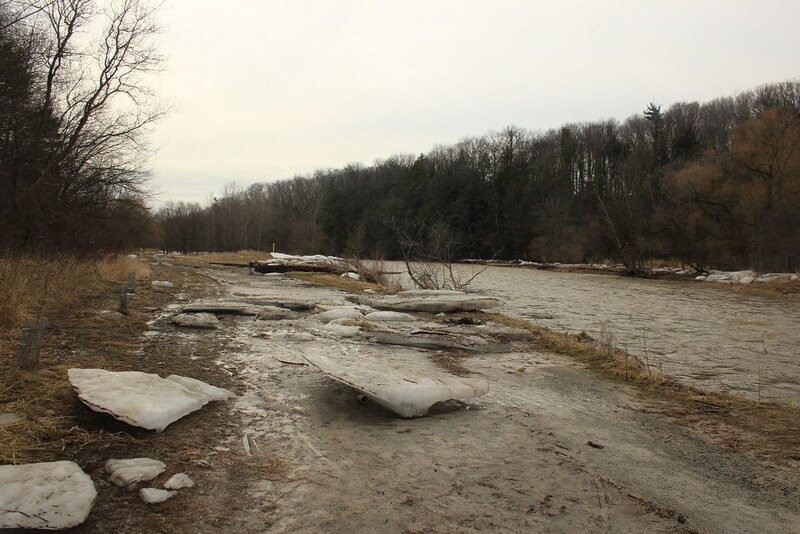 The Credit River flooding also left more than a few presents along the way. 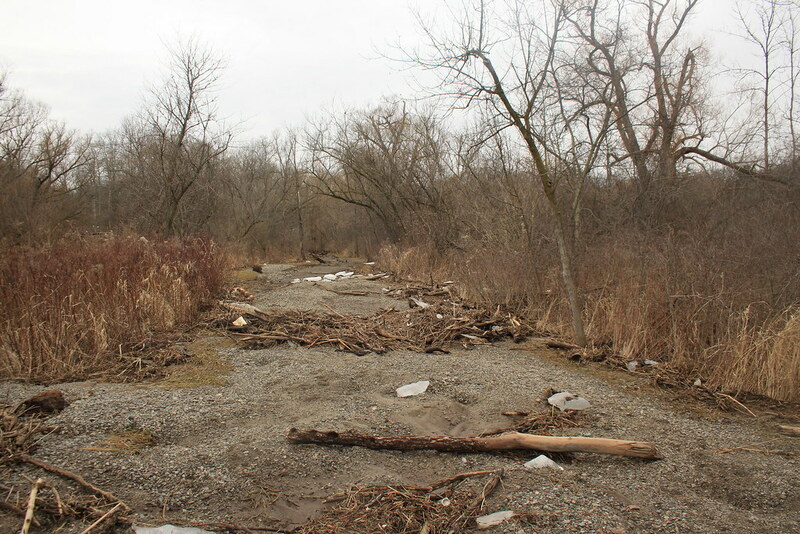 This next access point (which connects to Riverwood Park) warns you of the washouts – but there is no matching sign on the other side of this stretch! 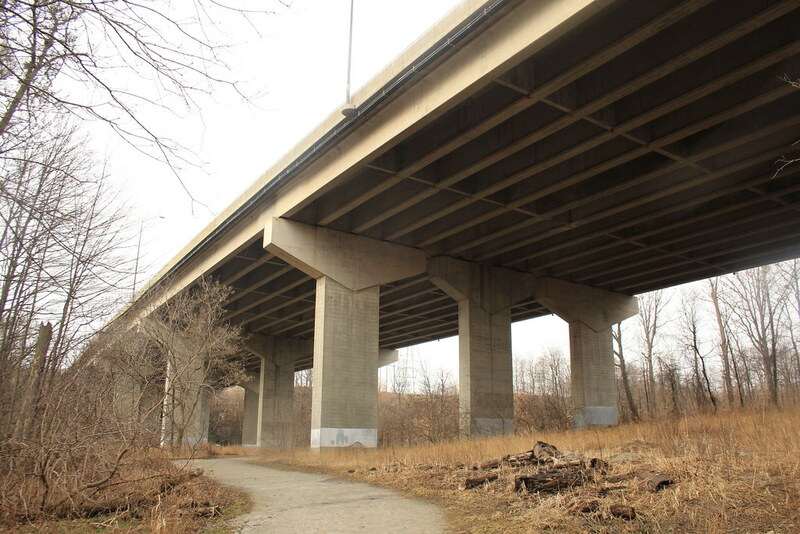 From here, Culham Trail weaves its way under the 403. A suspicious looking squirrel hopped ahead of us, so we were on our toes looking for an ambush. Fortunately, they must have figured out we didn’t have any nuts for them. 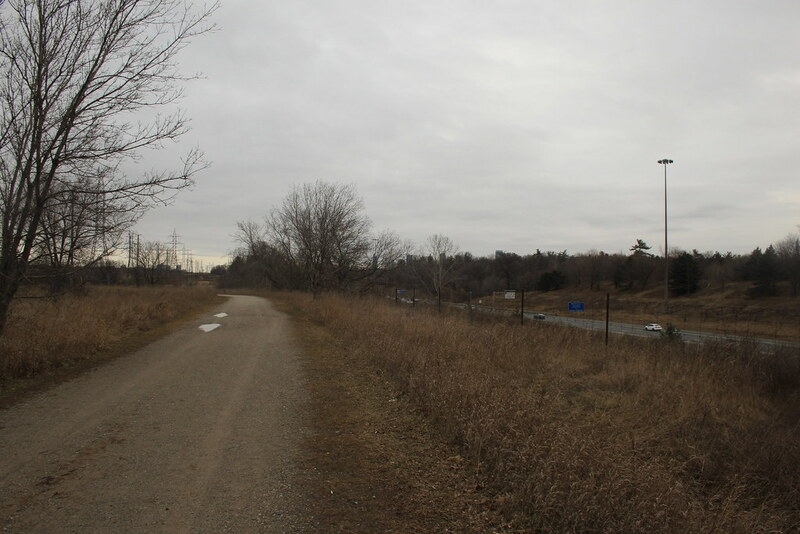 Then there is this long-ish stretch of access road along the 403, followed by a short jaunt through a typical suburban neighbourhood. 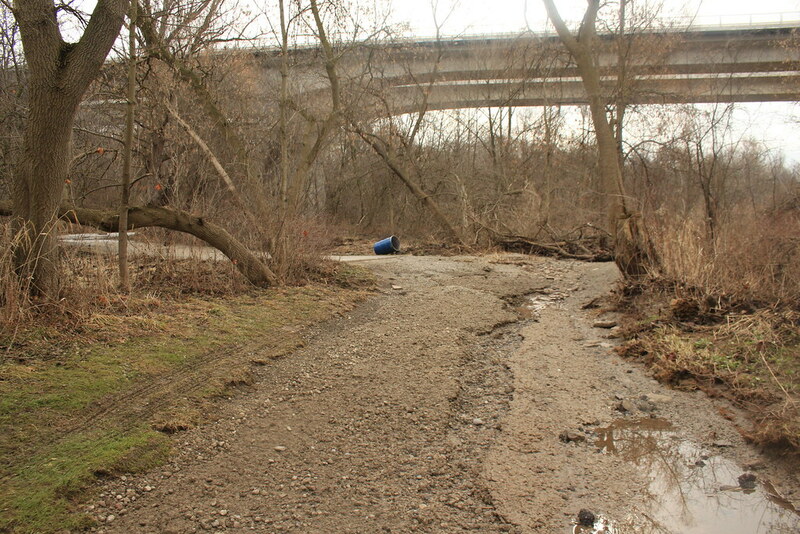 Both of these are reasons why I avoid urban hiking but I guess it could have been worse. There could have been people. 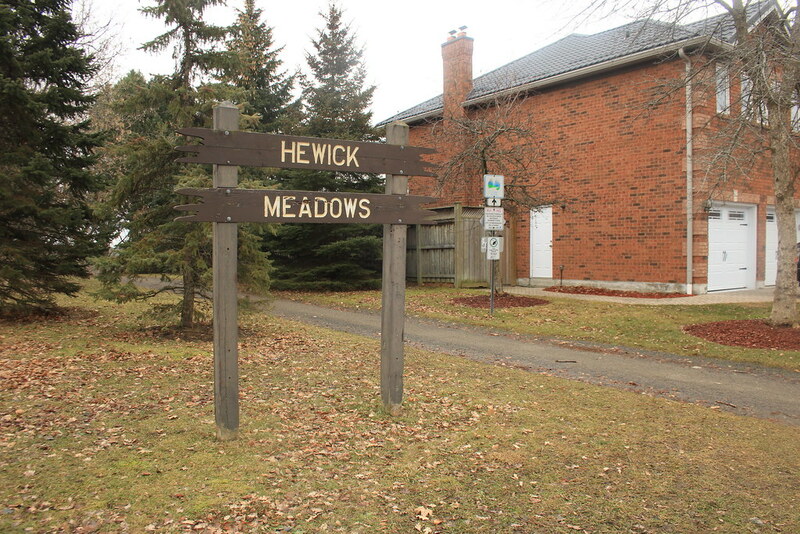 From the side streets, we make a right and head down in to Hewick Meadows. 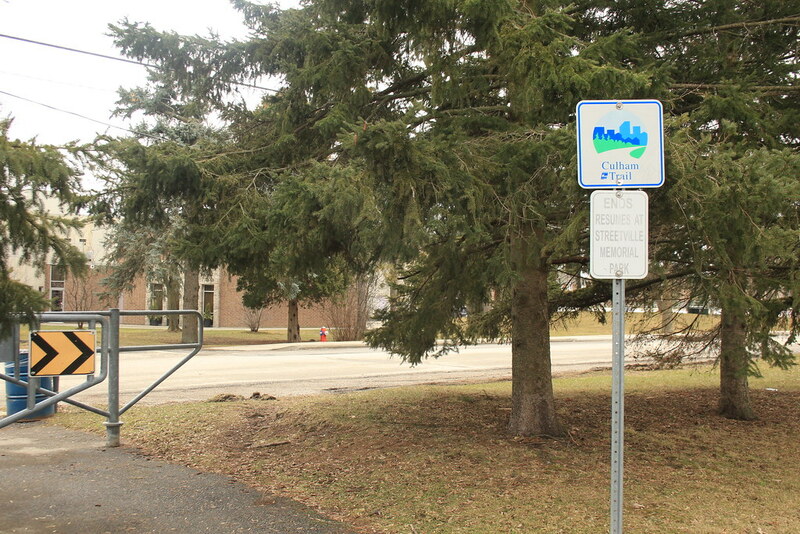 If you go left at this point you’ll be heading for Credit Pointe Village, and even further in to Surburbia. The first stretch of Culham Trail in Hewick Meadows was asphault, and probably for good reason. 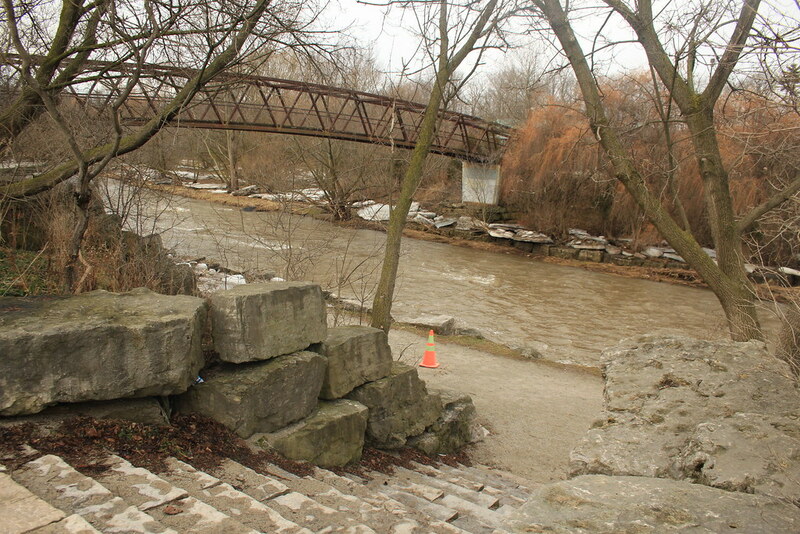 The rest of the trail through here to Eglinton was largely washed out. Plus, sinkholes. There was one exception that we climbed up to from the 8-inch drop of missing gravel. This lovely barriered section of the path gave great views over an ice-deposit. 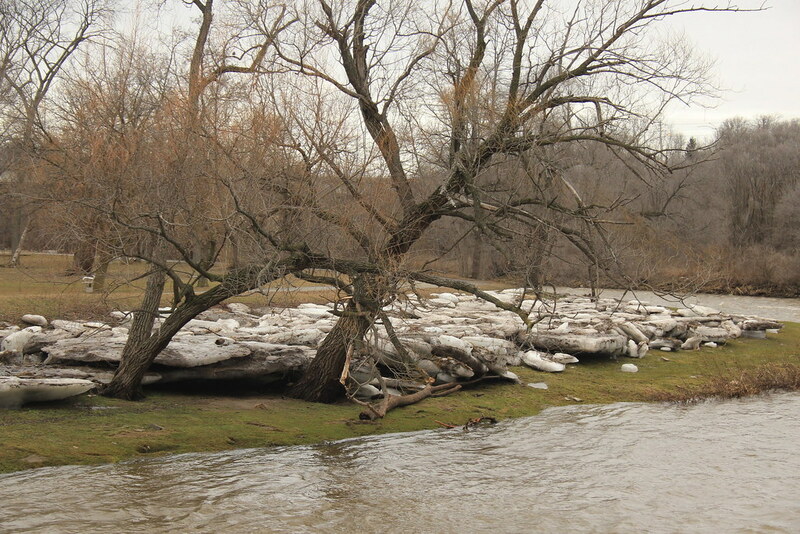 The trunks were able to withstand the ice flow – their lower branches? Not so much. 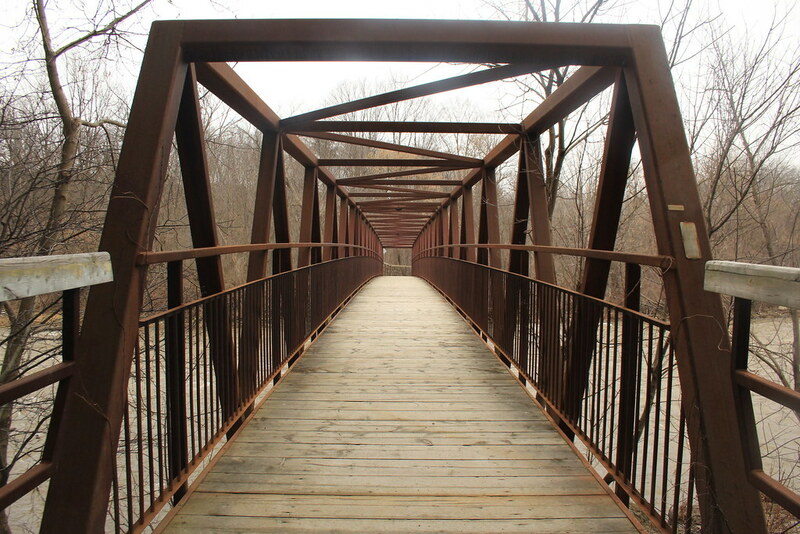 At Eglinton, you cross over the Credit River on another beautfiul bridge. I really like these bridges. This was Bryon’s Bridge, or so the sign would have us believe. 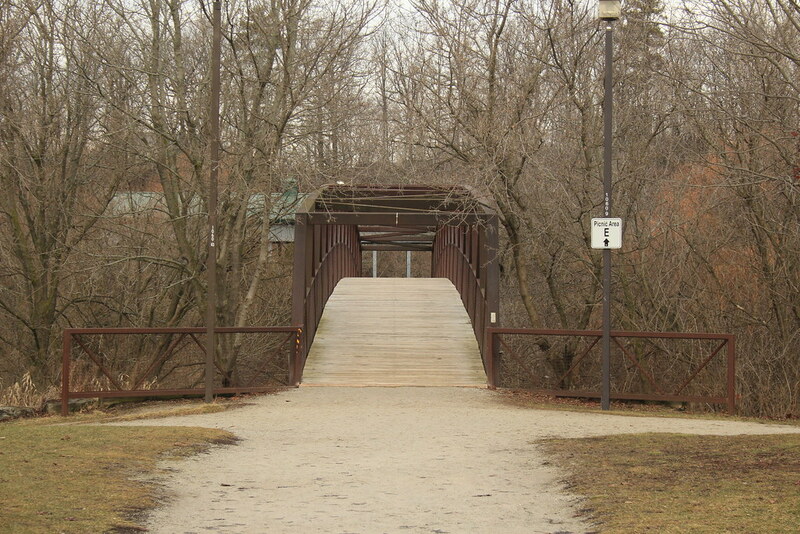 Culham Trail, from this point on, was largely a skating rink. At this point I almost wished I had my crampons. But then I remembered how fun it is to glide across the ice. And that’s how I made my way along here. 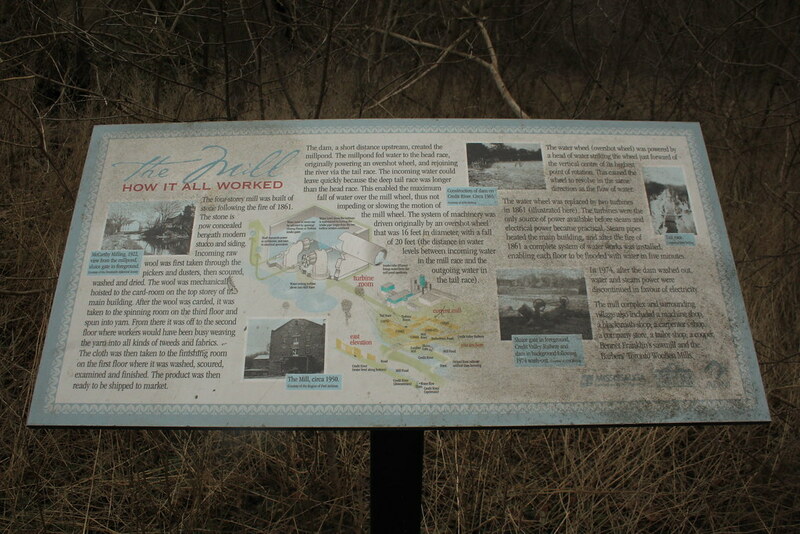 Nearing the end of this section of the trail now, we came across some interpretive signs and old mill machinery. 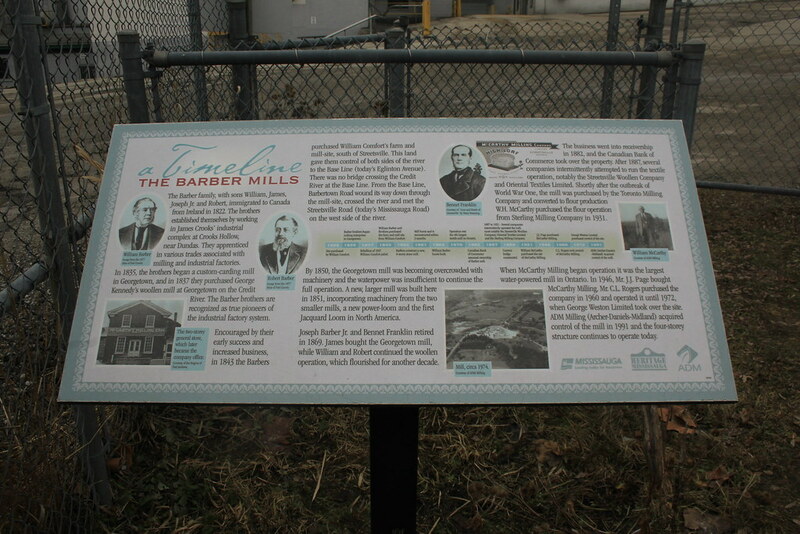 And of course, the mill itself – still operational after nearly 200 years. 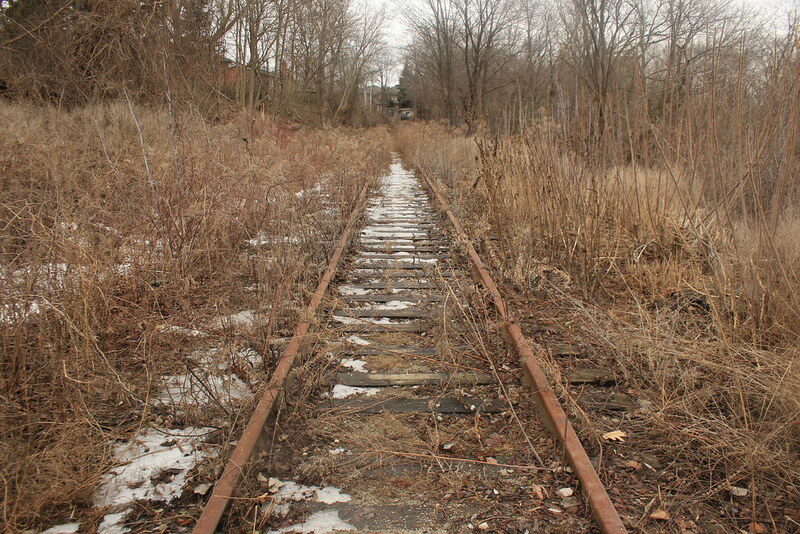 Although, the railroad is not so operational, it would seem. There are still signs here warning pedestrains of the crossing. Maybe it’s only used in warmer weather? 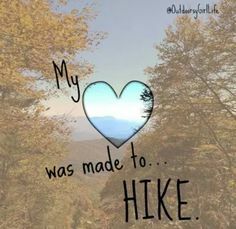 This brings us to the end of the trail. 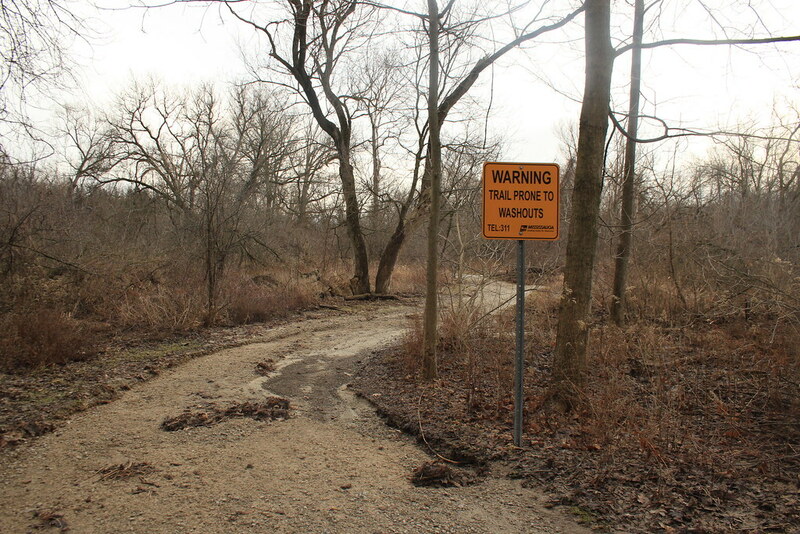 Well, the end of this section of the Culham Trail. It starts up again a little farther up the street. But that’s a lot of road-walking. Instead we decided to head back. 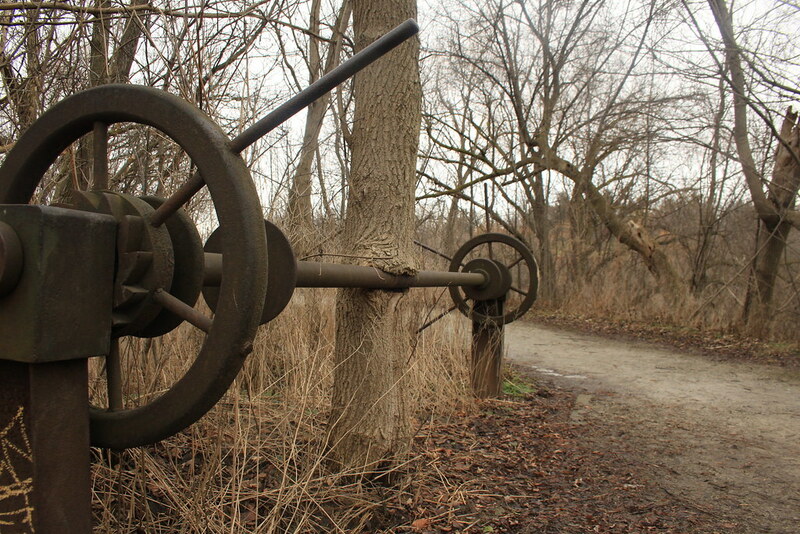 Back past the mill, and the bridge and remnants of the once thriving community. 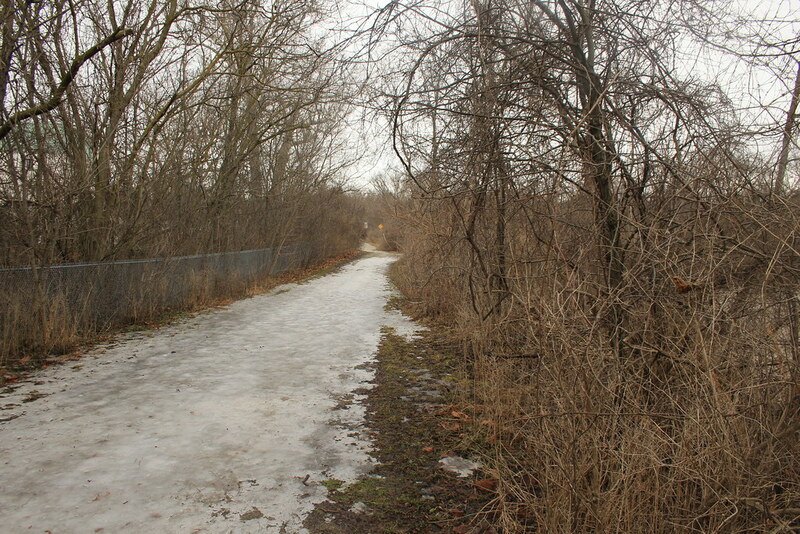 Back past the geese, along one of the few still-intact sections of the Culham Trail. 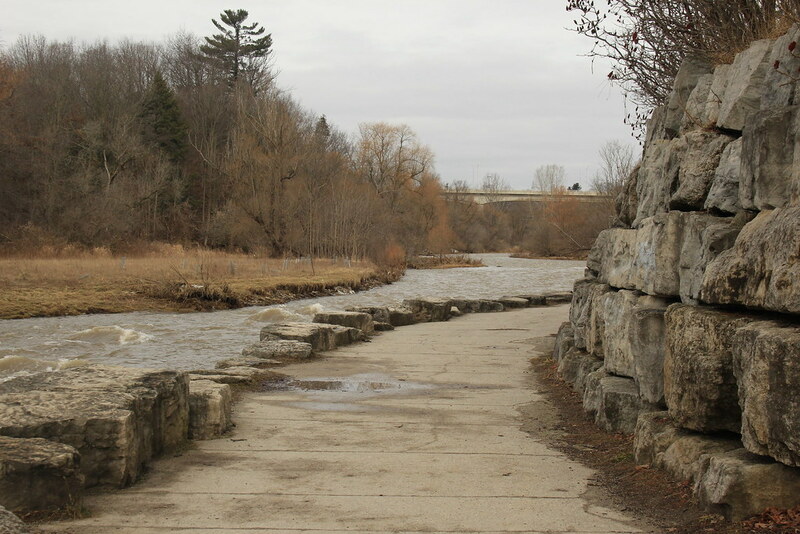 We made our way back to Erindale Park and decided to take the route along the Credit River’s edge instead now. A slight shortcut, as it were.